Mary Beth grew up in East Tennessee where the nearby lakes, mountains and backyard woods seemed magical. Her brothers and she called a section of woods along a creek Fairyland where much make-believe unfolded. Friendship with the trees, plants, animals and rocks nurtured her spirit. As she grew up, this relationship to the natural world faded. Responsibility to family and career filled her life. In 1996, while living in Atlanta, Mary Beth was introduced to Eliot Cowan’s book, Plant Spirit Medicine. The book stirred within her a deep longing to live a life more balanced and heart-centered. She also longed for the intimate relationship with Nature she once experienced. She knew her personal healing journey had begun. She began receiving plant spirit medicine in 2003, and in 2005 she began training to become a plant spirit medicine healer. 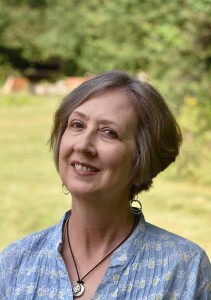 Since 2007, Mary Beth has offered plant spirit medicine healing in East Tennessee from her hometown of Oak Ridge. She has been inducted as a Lay Spiritual Healer in the Temple of Sacred Fire Healing. The wisdom and generosity of the plants continues to guide Mary Beth as her life’s work as a healer unfolds.